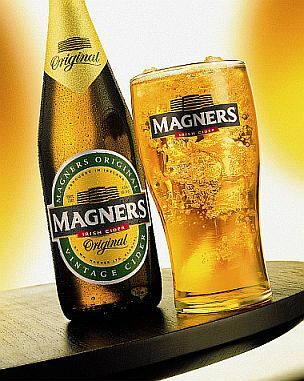 I had a chance to sample the Magner’s Cider as well. I gave it a shot on a really hot summer day and I have to say it came across as really light and refreshing. I’m not sure if I’m a huge fan of serving it over ice, or just serving it really cold off of ice or out of the fridge. I’m not a huge fan on drinking wine over ice either and have never drank beer iced – so maybe it’s just an experience thing. I decided to “split test” the experience a bit – so I tried half just chilled out of the fridge (in an iced glass) and half as recommended on ice. My vote is for serving with the bottle well chilled in ice or in a bottle cooler – it’s crisp and refreshing and was a hit on a hot day. I spent about a month in Europe when I was 22 and we drank a bunch of different ciders while there and we made it a goal to sample as many different brands as we could. Being the only non-beer drinker out of the three of us, plus being the one with the most cider experience, I wasn’t about to be left out of the taste test! I found Magner’s to be crisp with a very clean aftertaste and it totally lacked that cloyingly sweet taste that some ciders seem to have which is a bonus. The alcohol content was lower than many ciders I’ve enjoyed, but frankly this means you can have a little more before your knees give way, right? I didn’t try it without ice…mostly because I was sneaking it from Joel’s glass…but since I prefer my ciders not -too- cold, I’m sure it would great either way. I’d definitely give this a try on warm afternoon…or a cool one for that matter!